The spotlight for November 2017 features an individual who is not the traditional, the “norm”, that comes to mind when you say veteran. 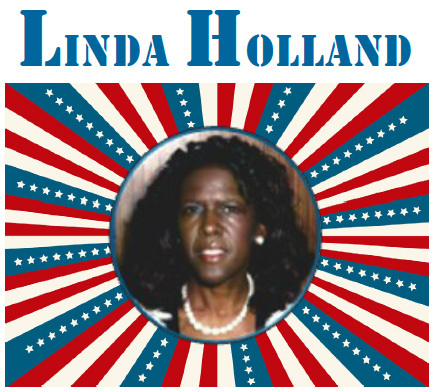 Our November spotlight is focused on Sister Linda Holland, a retired United States Air Force veteran. Her responses to several questions are reflected below. A: I was born June 4th in Leesburg, Florida. A: I enjoy reading, sports, car shows, and travelling. Q: What do you want to tell us briefly about your career including activities at Fellowship? A: Prior to being commissioned as an officer in the Air Force, I was employed as a registered nurse in Rome, Georgia. I entered the Air Force in November of 1977 and served our country for 21 years before retiring in 1997 . During my military career, I had various assign-ments both overseas and stateside with numer-ous jobs including serving as Medical Liaison for dignitaries including President Clinton. After retirement, I continued to work in nursing with public health as the first African American Director of Nursing for the Macon-Bibb County Health Department advocating bringing services to the underserved and providing community education. I remain active in the community and at Fellowship. Since joining Fellowship, I have served in the Nursery, Youth Christian Enrichment Teacher and currently in the following ministries: Event Planner, Health, Culinary, Mercy Showing, and teacher for Single Women over 35 Small Group. Q: What are the most important lessons you have learned in life? A: It’s not about what you look like or what you own, it’s about the person you’ve become because suc cess isn’t about how high you’ve climbed, but that you made a positive difference in the world. A: As a loyal friend, a person who tried to help peo ple, but most of all a committed child of God. Q: What is “your message” (words of wisdom) to Generations X, Y, and Z? A: Let God be your guide because He will direct you along the best path for your life. A: Seek ye first the kingdom of God and His righteous- ness, and all these things shall be added unto you.